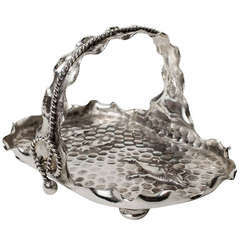 This is a stunning American Art Nouveau silver plated swing handle fruit basket, made in 1904. 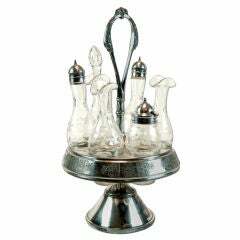 The tray has the stamp of the highly sought after silversmiths, The Meriden Silver Plate Co., USA. The basket is oval in shape with fluted sides. It has superb chased flowers to the swing handle and to the border and fine pierced decoration to the body. Add an elegant touch to your next dining experience. Condition: In excellent condition, with no dents, damage or repair, and only minor signs of wear consistent with age and use. Please see photos for confirmation. Dimensions in cm: Height 29 x width 31 x depth 24 Dimensions in inches: Height 11.4 x width 12.2 x depth 9.4 The Meriden Britannia Company was formed in 1852 in Meriden, Connecticut as a manufacturing company focused on producing wares in britannia metal. By 1876, the Meriden Britannia Company had grown a great deal and the company made significant efforts at the Centennial Exposition in Philadelphia in that year. The company won the First Place medal for plated wares. According to Sotheby's in New York, "The publicity of the award and the impression the firm made on the fair's 8 million visitors was continued by the catalogues and other intensive marketing; by the end of the 1870s Meriden Britannia Co. was considered the largest silverware company in the world." By 1891, Meriden Britannia had warerooms in New York (46 East 14th Street, Union Square); Chicago (47 State Street); San Francisco (134 Sutter Street); London, England (7 Cripplegate Buildings, Wood Street, E.C. ); and Paris, France (26 Avenue De' L'Opera). The main factories were in Meriden and a branch factory was in Hamilton, Ontario, Canada. By 1893, the company had expanded production with its floor surface covering over eight acres of space in downtown Meriden. In 1898, the Meriden Britannia Company became part of the larger International Silver Company corporation headquartered in Meriden. Afterwards, while part of ISC, many designs were produced under the Meriden Britannia brand with design trade catalogues specifying Meriden Britannia wares. Meriden Britannia Company designs are included in many museum collections, including the Brooklyn Museum, New York; Dallas Museum of Art; Davis Museum at Wellesley College, MA; Jewish Museum, New York; Wadsworth Atheneum, Hartford, CT; Mint Museum, Charlotte, NC; Victoria and Albert Museum, London, England; Wolfsonian FIU, Miami Beach, FL; Yale University Art Gallery, New Haven, CT. Recent museum exhibitions featuring Meriden Britannia designs include Life, liberty, and the pursuit of happiness (2008–12) at the Yale University Art Gallery, and travelled to Louisville, KY; Seattle, WA; and Birmingham, AL. In 1994-95, Meriden Britannia was included in the Dallas Museum of Art's Silver in America, 1840-1940: A century of splendor exhibition, and in 1986-87 at the Metropolitan Museum of Art's exhibition In pursuit of beauty: Americans and the Aesthetic Movement. In 1985, Meriden Britannia was included in a special exhibition at the Palácio Nacional da Ajudo, Lisbon, Portugal, which was organized on the occasion of U.S. President Ronald Reagan and the First Lady's visit to the city. Woven silvered basket by Christolfe, circa 20th century. Originally retailed at Berdorf Goodman for $1195 in their vintage home collection.